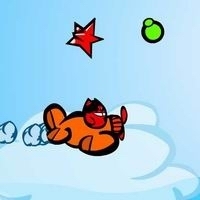 Fly your aeroplane and avoid the obstacles with your mouse. Press the button to go higher and release it to go down. Don’t fall through the bottom of the screen, that’s a crash. try to get as many gems as possible for the highscore and avoid bombs, you can use the shield to blast a bomb.